FEMA Registration Deadline TOMORROW – November 30! Residents impacted by Harvey have until TOMORROW, November 30, 2017 to apply for FEMA assistance and/or apply for a low-interest U.S. Small Business Administration (SBA) disaster loan. You can apply online at www.disasterassistance.gov, by downloading the FEMA app on your mobile device, calling the FEMA Helpline at 800-621-3362, or visiting a Disaster Recovery Center (DRC). If you have already applied with FEMA/SBA and have questions or concerns regarding your application you can visit any of the open DRCs. To find the DRC location nearest you click here. Disaster Outreach Center is set to close Wednesday, December 20, 2017 at 6 p.m.
For additional assistance questions, call SBA’s Customer Service Center for any questions at (800) 659-2955. The FEMA Disaster Recovery Center at Simonton Community Church has transitioned to a Small Business Administration (SBA) Disaster Loan Outreach Center, starting Monday, November 27, 2017. Residents can meet with the SBA to discuss the SBA’s disaster loan program, complete applications, close approved loans, and get questions answered. SBA customer service representatives will be available at the DLOC to meet individually with businesses, homeowners and renters to answer their questions, explain SBA’s disaster loan program, help them complete their applications and close their approved loans. Businesses of all sizes and private nonprofit organizations may borrow up to $2 million to repair or replace damaged or destroyed real estate, machinery and equipment, inventory and other business assets. The SBA can also lend additional funds to help businesses and residents with the cost of making improvements that protect, prevent or minimize the same type of disaster damage from occurring in the future. For small businesses, small agricultural cooperatives, small businesses engaged in aquaculture and most private nonprofit organizations of all sizes, SBA offers Economic Injury Disaster Loans to help meet working capital needs caused by the disaster. Economic injury assistance is available regardless of whether the business suffered any property damage. Applicants may apply online using SBA’s secure website at disasterloan.sba.gov/ela. Survivors can still register for federal disaster assistance in the following ways until Nov. 30, 2017. SBA’s Customer Service Center can answer any questions at (800) 659-2955 as well. FEMA Disaster Recovery Centers (DRCs) will be CLOSED Thursday and Friday (Nov. 23 and 24, 2017) for the Thanksgiving Holiday. DRCs will reopen on Saturday, Nov. 25, 2017. To locate a DRC nearest you, visit http://asd.fema.gov/inter/locator/home.htm. Candlelight Vigil for Hope & Healing – October 10th! 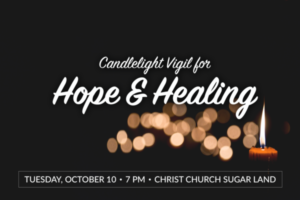 In response to the devastating effects caused by Hurricane Harvey, Christ Church is holding a community “Candlelight Vigil for Hope and Healing” on their front steps on Tuesday, October 10th, beginning at 7 pm. Everyone is Welcome! Community Event for Hurricane Harvey Recovery – October 7th! Join us for a special event hosted by Fort Bend Recovers on October 7th, 2017. Case managers, local government agencies and non-profit organizations will be there to assist with any questions about your recovery process from Hurricane Harvey. Join us for a special event hosted by Fort Bend Recovers on September 30th, 2017. Case managers, local government agencies and non-profit organizations will be there to assist with any questions about your recovery process from Hurricane Harvey. Family friendly activities will be available outside as well!